Huh, what? Oh yeah. Time for the performance update. My main goal is to build a portfolio of $1,000,000 in 1500 days with no debt*, starting from 1/1/2013. Every month, I provide an update on my status. My goal for 2014 is to get my portfolio up to $768,536. Because we saw exceptional returns in 2013, I have accomplished this goal as well as my goal for the end of 2015. Time to look back on the month of September. Left to go (2014): Goal accomplished! As long as we’re on the topic of Apple, I have placed orders to sell most of my shares. Over 15% of my portfolio is in Apple alone and that is just ridiculous. This over-allocation along with my uncertainty about the company’s long term prospects makes me nervous. However, I also don’t want to take a huge tax hit. My compromise is to place a trailing stop loss order. If the stock drops a certain percentage from its all-time high, Apple says “bye-bye” to my portfolio. I have too much facebook as well and have placed a similar order for most of that stock. See, I told you, boring. Oh, what? Still there and awake? Let’s move on. I hope neither of these orders trigger. I’d much rather sell when my working life is done and I won’t have to pay anything in capital gains. Since I’m a couple years away from my planned retirement date, I think that this scenario is a long shot. Time will tell though, won’t it? A screen capture from Personal Capital***. Just so you know I’m not making it up! If your portfolio bounces up and down like a super ball, you may want to question what you’re doing. After those Apple and facebook orders execute, I’ll move the money to boring stuff like index funds. The crazy thing about investing is that the boring, stable index fund is not only the simplest, but the best thing to put your money in. It is time for bed and I’m getting very sleepy. However, there is one more thing I need to tell you. Now, I don’t normally make predictions, but I’m going to make an exception here. I have a hot stock tip and a pretty solid prediction about where the markets are headed for the rest of 2014. Before I get to that though, don’t forget to check out the blogger net worth page on Rockstar Finance. There are a lot of really sharp folks in this little blogger community. *I still owe something like $120,000 on my mortgage. Because I have a low rate, I firmly believe in not paying it off. My compromise is to have enough money put away to pay off the mortgage at time of retirement. So, to retire today, I would need about $1,120,000. 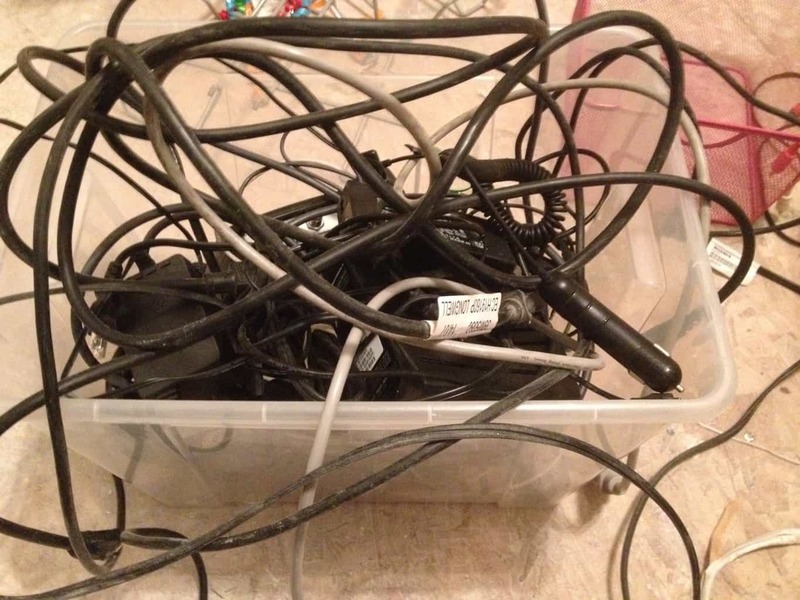 What are all of these cords for?!? ***Personal Capital: This is an affiliate link. If you sign up, the blog makes a little bit of money. With that out of the way, I would never recommend anything I didn’t use myself and completely believe in. Personal Capital is totally free and an awesome way to keep watch over your investments. It is worth if for the fee analyzer alone. I’m a firm believer that “Boring” is the best compliment one could give to a investing portfolio. Speaking of boring, how did you decide how deep to set your stop loss order? Yes, “boring” is totally the correct answer. I am late to the boring game, but better late than not at all. I put my orders at 8%. I don’t want the stocks to sell just because the market takes a hit one day, but I don’t want to lose too much either. If you can’t already tell, I just pulled that 8% number out of my you-know-what. It’s still amateur hour here at 1500 Days! Mrs. Pop @ Planting Our Pennies recently posted…Won’t You Be My Neighbor? What really drives me nuts are all of the power supplies. I don’t know what 95% of them are for, but I keep them anyway. I guess I’m a power supply hoarder. Ahh boring!!!! Just kidding! Hopefully you can retire soon! 🙂 It will show to the younger that it is possible. I’m surrounded by high paying folks at work that say they can’t ever retire and will have to work till they die. Yikes….depressing. Couldn’t hurt to mix a covered call in there as well. Juice the returns a bit if the stock stays flat, and forces you to diversify if it goes up. Either way, some action here is good and I’m glad you moved forward with the trailing-stops. I hope all is well! I too have a surprising large collection of computer cables… came in handy the other day when I wanted a long Ethernet cable and happened to have a 25ft one laying around. You’re right, that was the most boring performance update….ummm….ever. But I’m still amazed that you had achieved your 2014 goals by june (?) and everything else is just icing on the cake. Well done! I’ve actually achieved my end of 2015 goal as well! Life is good. What better motivation to become financially independant than to avoid the above scenarios?! I thought you would have learned your Taco Bell lesson after the GABF. Good job on the 2015 goal! Your portfolio at Personal Capital looks like a nice relaxing summer day, some nice earthy colors, if that was my portfolio I think I would request Red, White, and Blue because I would be celebrating every time I logged in. Boring is good. Looks like we all took a hit on our portfolios in September but that’s tough not to when the marker was down. If “boring” equates to more than $360k gains in less than 2 years then sign me up! Whatever you’re doing, it’s working and I hope your portfolio keeps rising till your reach your goal. It looks like you’re guaranteed to get there well ahead of schedule: will you keep going till 2017 or call it quits when you hit the million? Myles Money recently posted…Happy Birthday To Me! What you may call boring I call a “sleep well at night” portfolio. Having that kind of stability in a portfolio to me shows well thought out diversification. Congrats on hitting your milestone as well as you are definitely on your way to hitting that $1M mark. Thanks for sharing. I love how close you are to the $1 million milestone – you’re just hovering over the brink now. If the markets pick up this fourth quarter, given the consumerist frenzy that normally accompanies the holiday season, you might even hit the 7-digit net worth before the end of the year! If Apple and facebook knock it out of the park with their earnings, I’ll be a millionaire in a couple weeks. However, we could also have a 20% correction and then I’ll have to wait another couple of years. I really don’t think too much about it. And, I’ll have a cold beverage waiting for you when you cross the mark too! I’m all for boring. It sounds like an insult, but it really is a great compliment to a portfolio. It should just keep chugging along. Alicia recently posted…Broken Laptop? No Problem! Thanks, I hope it stays boring or gets exciting because it’s going up so much. Ha! Ha ha, exciting yes. Terrifying as well. My heart beats like a hummingbird’s every time Apple’s earnings come out. One more reason I have to be more like you.